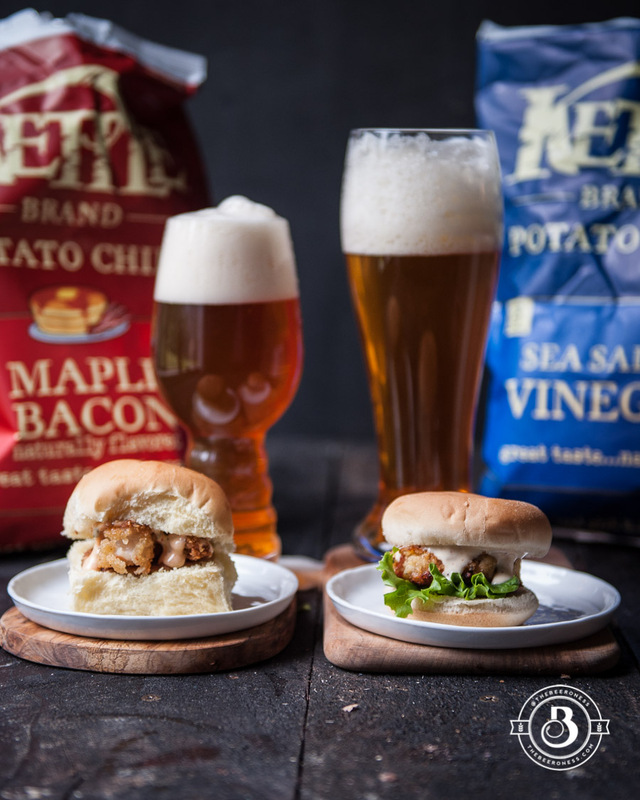 Which slider recipes will come out on top: Crab Cake Sliders made with Kettle Brand Sea Salt and Vinegar Chips, paired with a pilsner, or Shrimp and Grits Sliders made with Kettle Brand Maple Bacon Chips paired with an IPA? I’m going to wager a bet that your weekend may be spent, in part, gathered around a TV, screaming at millionaires fighting over an oval object. Only, of course, if you’ve decided to watch the Super Bowl. Maybe you’re rooting for one of the teams, or just rooting against the other. Maybe you don’t really care either way as long as the food is good. That’s why I’m here. To make both the food and the wagering more interesting, especially for that last set. For those of us whose teams have long since packed up their away game jerseys and started their vacations. You can still get in on the head-to-head beating action. 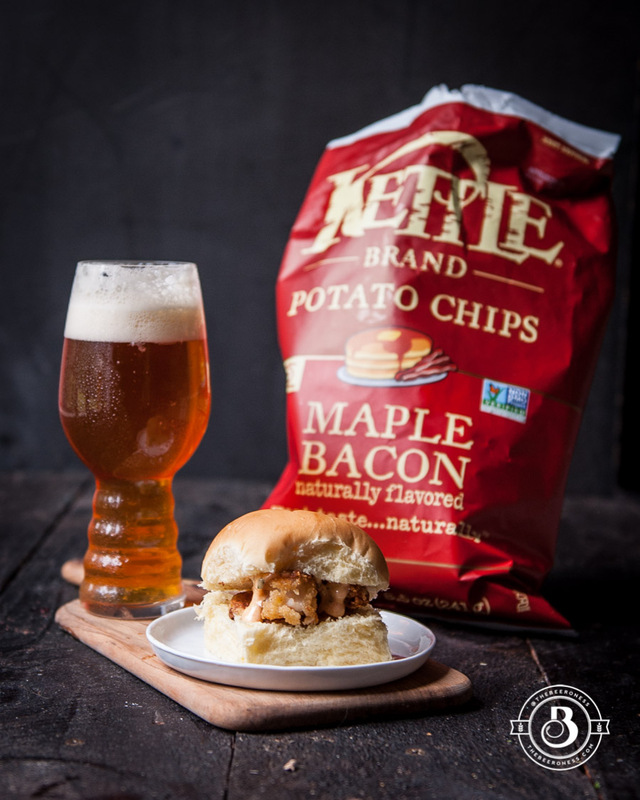 I’ve teamed up with Kettle Brand to bring you a bet that no one loses, inspired by the two remaining football teams. 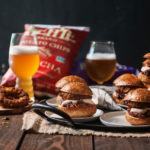 For the New England Patriots I made some sliders inspired by both their hometown and their team colors, and I’ve paired it with a beer that plays perfectly with the flavors. For the Atlanta Falcons I drew some Southern inspiration to bring you a slider like no other I’ve seen before, a re-imagination of one of my favorite dishes from the South. 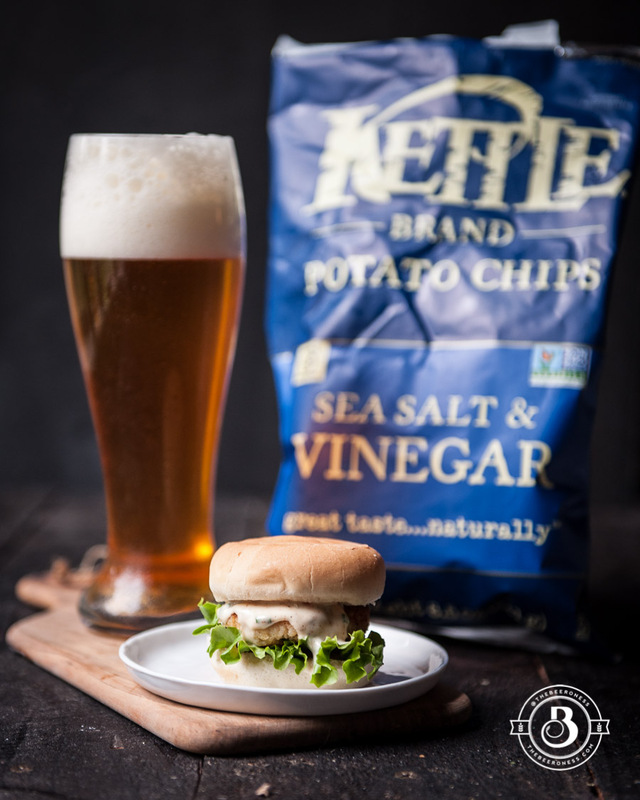 I’ve paired it with a beer that packs a punch, perfect for the sliders. 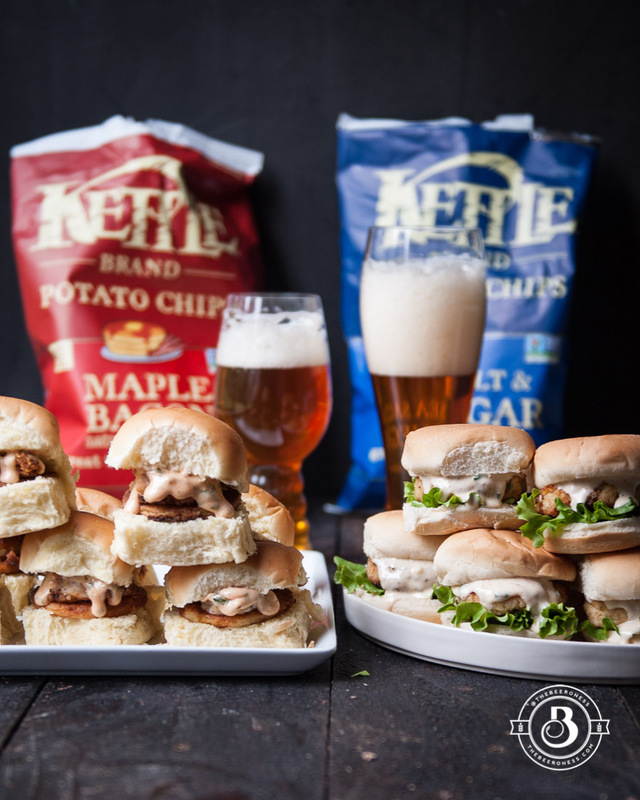 So here is your game day challenge: Make the sliders, pair them with the beer, and have your guests pick the best match. Will the winning sliders be the same team that wins on the field? Who knows. But I’m certain that unlike what will happen on the field, there will be no losers on your food table. Add the chips to a food processor, process until just crumbs remain. Add the chips, crab meat, salt, pepper, cayenne, Old Bay, egg, chives, and bell pepper, mix to combine. Lay a sheet of aluminum foil on a flat surface. Form the crab cake mixture into a long log down the center of the aluminum foil, roll the foil around the log until tightly covered, twist the ends. Place the log in the freezer for 15 minutes (to make this in advance, refrigerate for up to 24 hours, then freeze just prior to use). Remove from the freezer and slice the log into 12, 1-inch slices. Heat the butter in a large skillet. A few at a time, gently press the circles with a flat hand to make them slightly thinner and more compact. Place the crab cakes in the skillet, cooking on both sides until golden brown, about 5 minutes. Remove from the skillet, place on a stack of paper towels. Stir together all the remoulade ingredients until well combined. 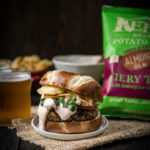 To assemble the sliders add a piece of lettuce, and a crab cake to the middle of each bun, drizzle with remoulade, serve immediately, with a pilsner. In a pot over medium high heat bring the milk, beer and butter to a boil, reduce heat to maintain a low simmer. Stir in the salt, pepper, and grits. Simmer, stirring occasionally until the grits have softened, about 20 minutes. Stir in the cheese. Line a 9x12 pan with parchment paper. Pour the grits into the prepared pan. Allow to cool to room temperate, cover and refrigerate for 1 hour and up to overnight (can be made a day in advance). Remove the grits from the pan using the parchment paper. Lay the parchment with the grits onto a flat work surface. Using a 2-inch, round, biscuit cutter, cut out 12 circles. Add the flour to a shallow bowl. Heat a thin layer of oil in a skillet over medium high heat. One at a time lightly coat the grit circles in flour, add to the hot oil, cooking on both sides until golden brown. Remove from oil and allow to drain on a stack of paper towels. Add the potato chips to a food processor, process until just crumbs remain, add to a shallow bowl. In a separate bowl whisk together the milk and egg. In a third bowl add the flour. Heat about ¼ inch of oil in a large skillet over medium high heat. One at a time dredge the shrimp in flour, then dip in the egg mixture, then place in the bowl of chips. Sprinkle with chip crumbs, pressing to adhere. Place in the hot oil, cooking on both sides until golden brown and cooked through, about 5 minutes. Remove from oil, add to a wire rack to cool. In a small bowl whisk together the mayonnaise, hot pepper sauce, paprika, and parsley. 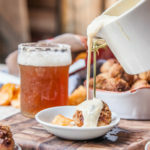 To assemble the sliders add one grits circle to the inside of each bun, top with one to two shrimp, drizzle with sauce. 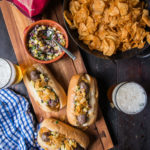 Serve immediately, with an IPA beer. We made these for the game and they turned out amazing! It was a tie – 3 votes for crab cakes, three for shrimp and grits!